Every year, my daughter's school make a big effort to raise money for Remembrance Day and the children gain a lot from learning the significance of the poppy. 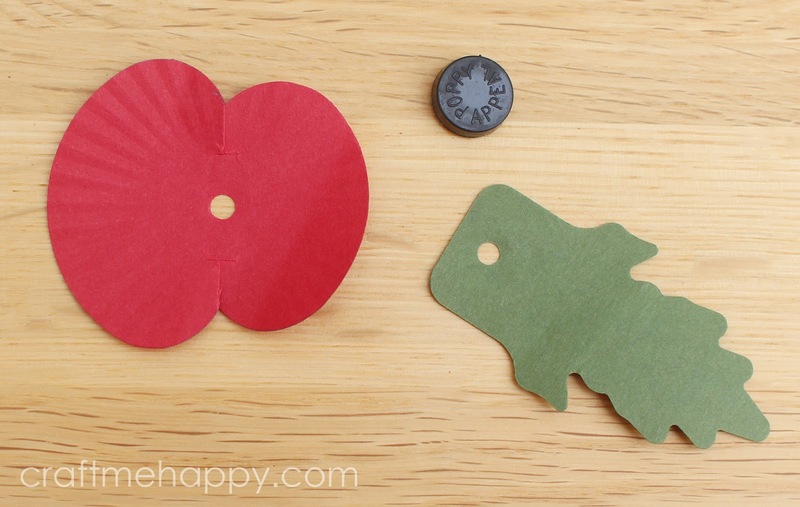 Every year, I buy my daughter at least 3 poppies with a sticker on the back, and every year she's lost her poppy by the end of the school day. The children selling them this year were highly amused by the fact that they weren't allowed to sell the pin-on ones to children for health and safety reasons - Of course, I completely understand why! 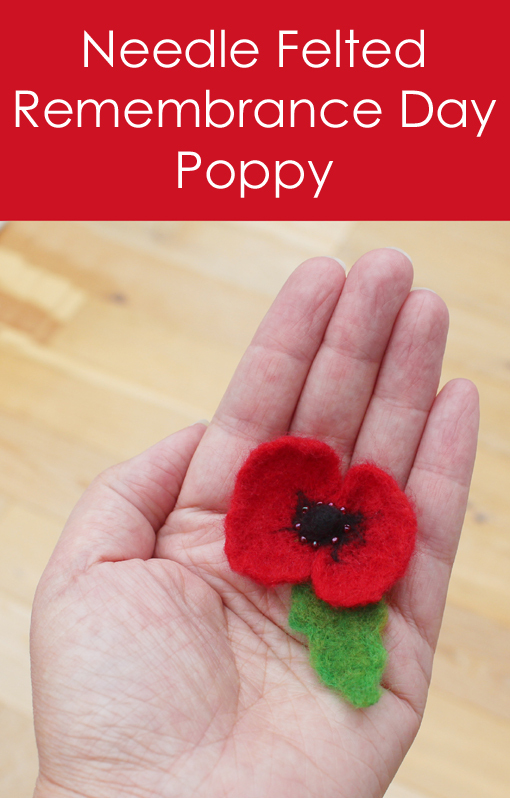 A couple of weeks ago I bought this one for myself and a sticky back one for my daughter and, as usual, her poppy had fallen off by the end of the day. 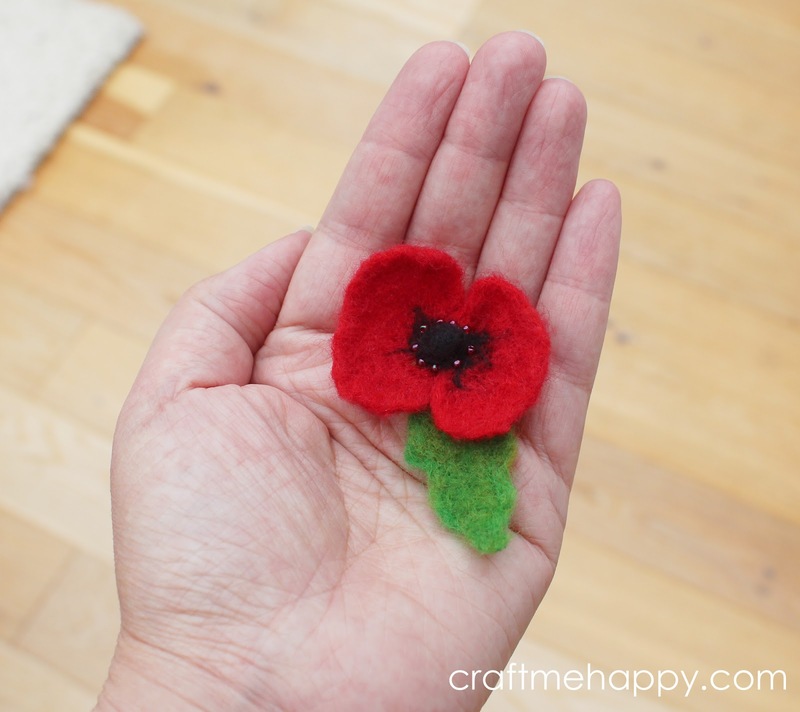 I wanted to make her a simple needle felted poppy that would at least last a couple of weeks, instead of a couple of hours that the sticky back paper ones seem to. 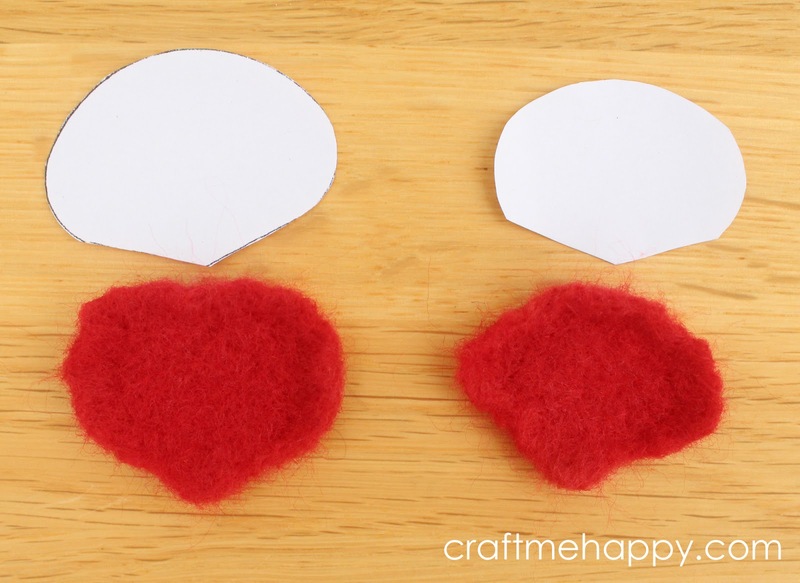 ... and I tried to use the paper shapes as a template to needle felt my own. 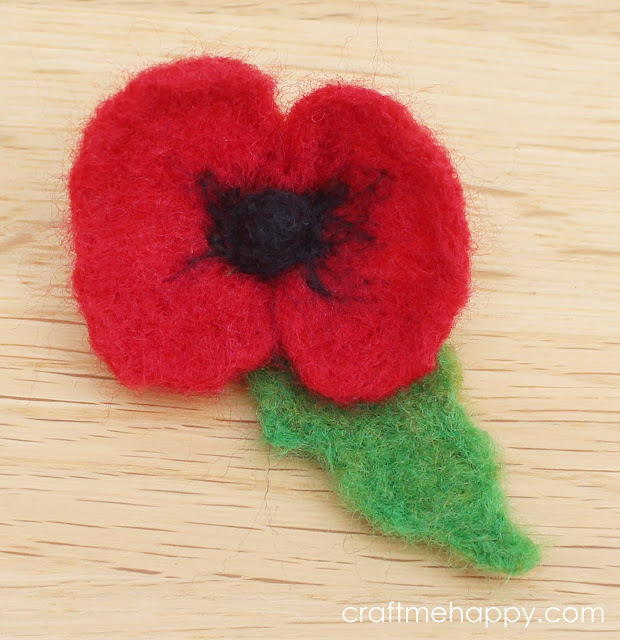 Unfortunately, as the red poppy part was made as one piece, it just ended up looking a bit flat, and the centre where the petals were gathered in looked a bit weird. It reminded me a little of elephant ears! 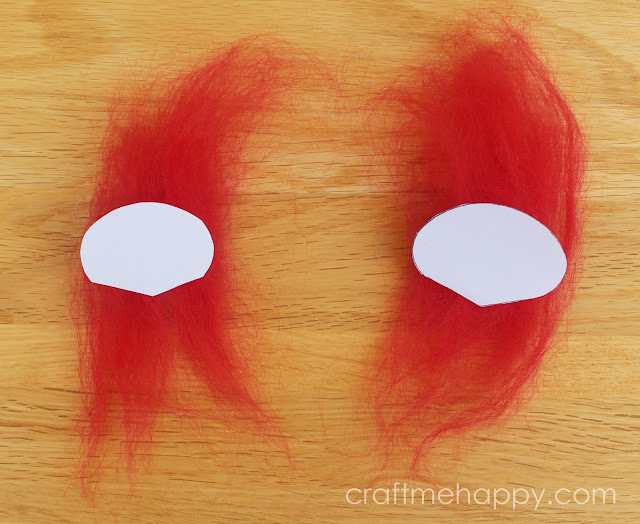 I should probably say, I wouldn't class myself as an expert in needle felting, but it occurred to me that it would look a bit more natural if I made it out of two separate petals. Here's the template I used to make my two poppy petals. You can print a pdf of it at the right size here. I usually like to blend at least two colours when I'm needle felting. I just think it gives a more natural effect to whatever I'm making. 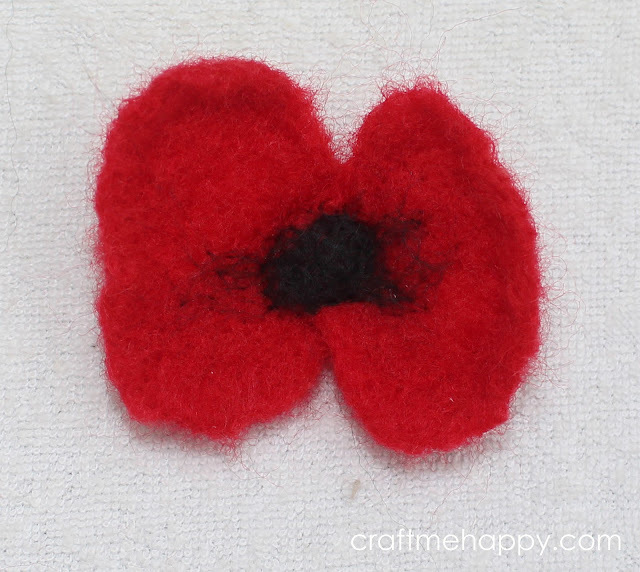 For the red, I blended poppy and scarlet, and for the green, I blended lawn and lichen - all from World of Wool. The green is a little more vivid than I would like, but it was all I had in at the time. 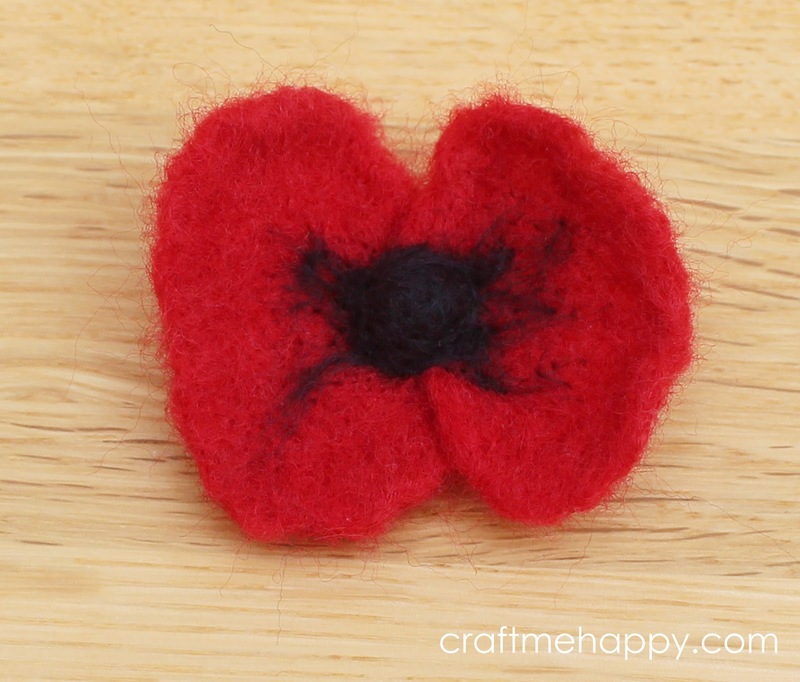 I also used a tiny bit of black for the poppy centre. Here's the amount of wool I used for each petal. I usually seem to start off with a lot more wool than I need, but I'm gradually learning that less is usually better - I can always add more! 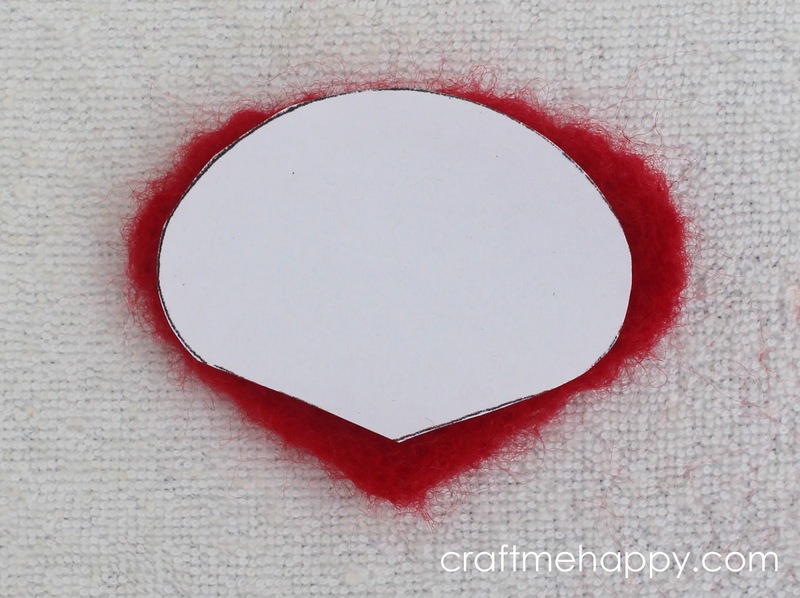 I use a memory foam pillow to needle felt onto, which has this terry toweling cover. I'm afraid, it's not the most attractive of backgrounds, but it looks a little better than the grey foam underneath! 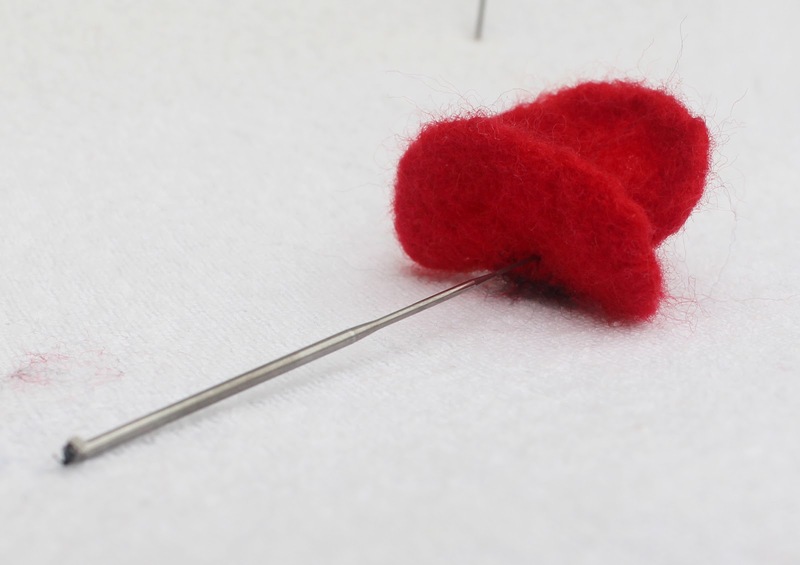 Needle felting is basically stabbing a mound of wool with a barbed needle, thousands and thousands and times, until it felts together into a solid shape that has a structure of its own. There's something extremely therapeutic about stabbing wool with a very sharp needle, gradually sculpting it into the shape it wants to become. Here, I've just shaped the wool into a basic petal shape. 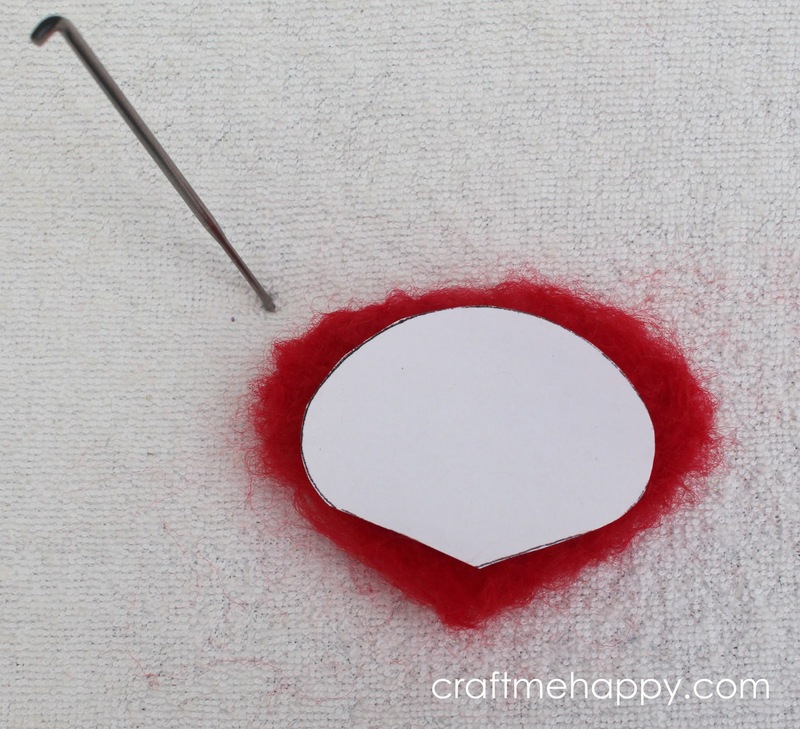 The more you stab it, the more it shrinks and felts together. I kept on stabbing it all over and turning it over. With every minute it became smaller and more compressed. 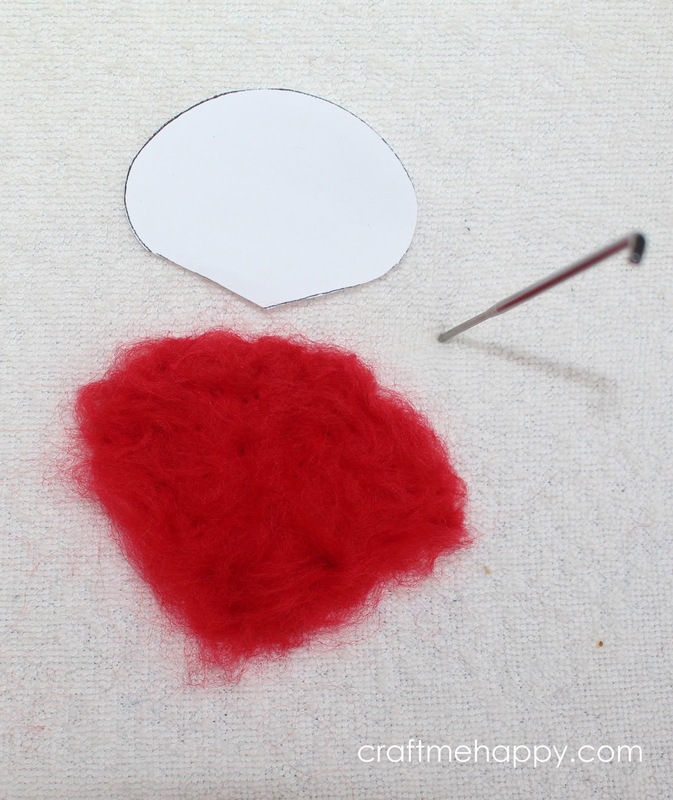 Every few minutes I'd check my petal for size against the template, picking up the stray fibres from around the edges with the end of my needle and stabbing inwards towards the centre. By this point, it was starting to become denser, but it was still a little fluffy. I tend to poke my wool in lines radiating inwards, flipping it regularly, sculpting it into the shape I want it. When it was the same shape and size as my template, I decided to give it a little shape by pricking repeatedly in an arc shape, a few mm in from the top edge of the petal, which encouraged it to curl into a more natural shape. 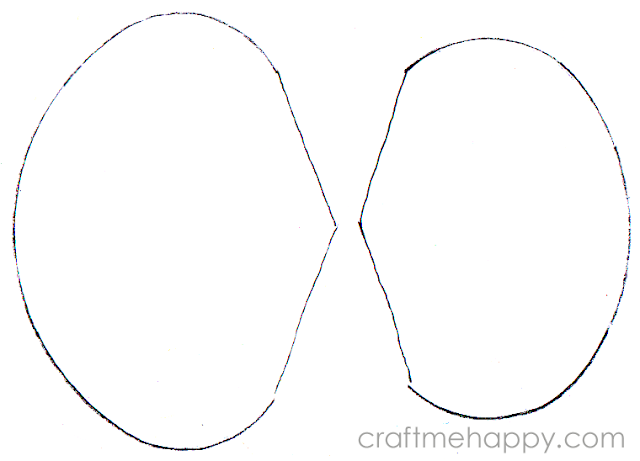 I then made the second petal in the same way. 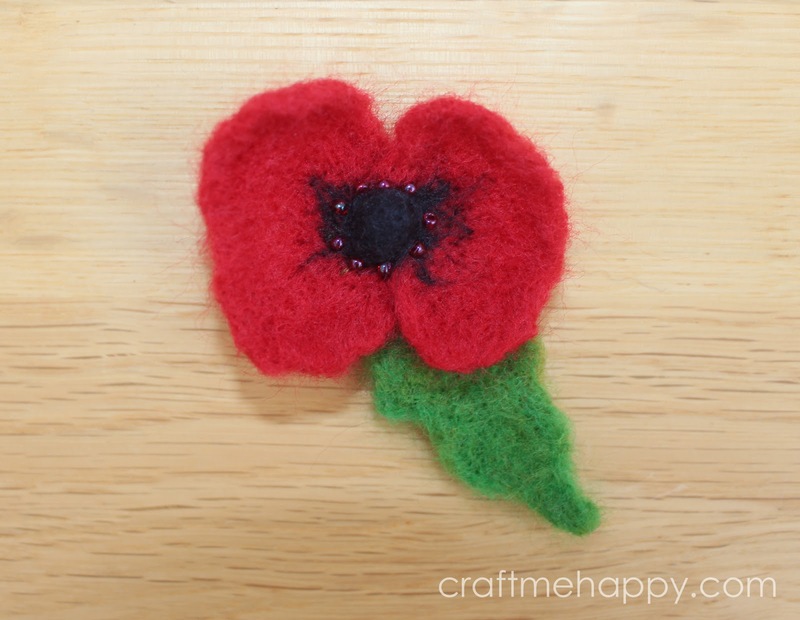 Once I was fairly happy with both of my petals, I overlapped the centres and took a wisp of black wool - both to start forming the poppy middle, and to attach the petals together. I overlayed a little piece of black merino wool so that the small section on the right would become black shading on the petal and the larger section on the left would begin to form the round flower centre. 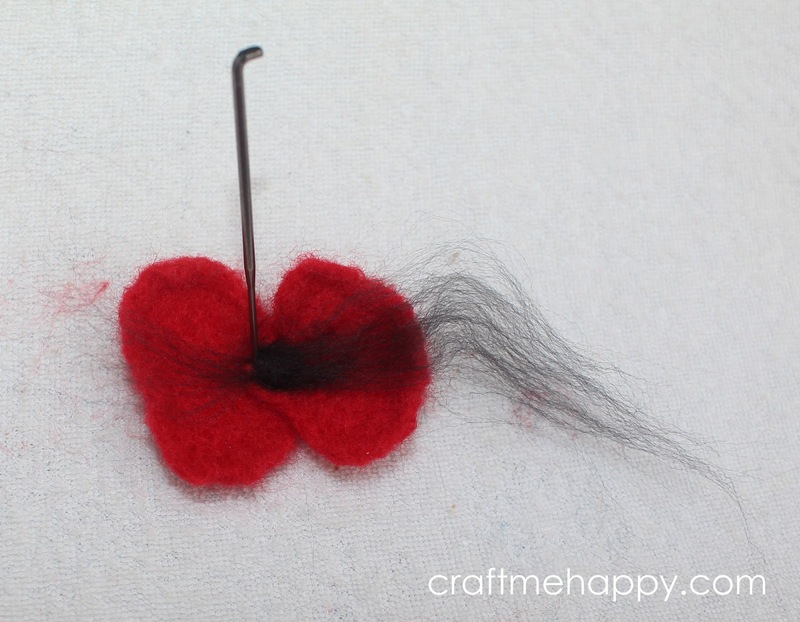 Here's how it looked when I'd needle felted the black wool into the centre, with a few wisps of black felted in on the right. 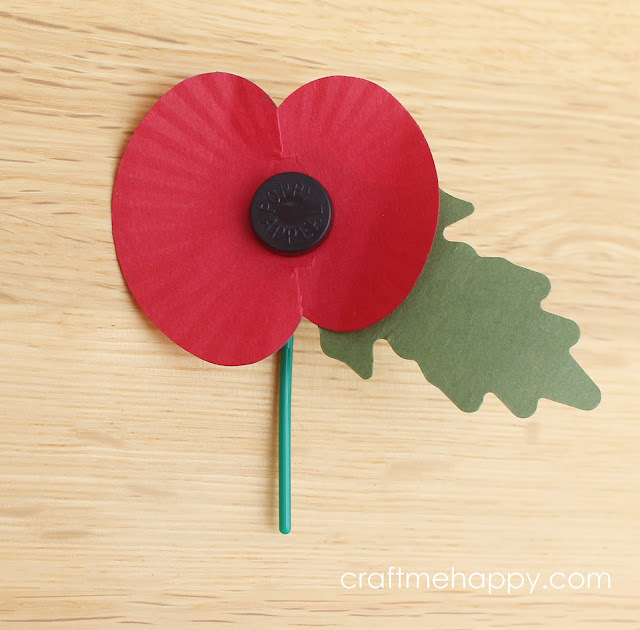 I repeated the same action on the opposite side, building up the poppy centre and adding wisps of black to the left petal. 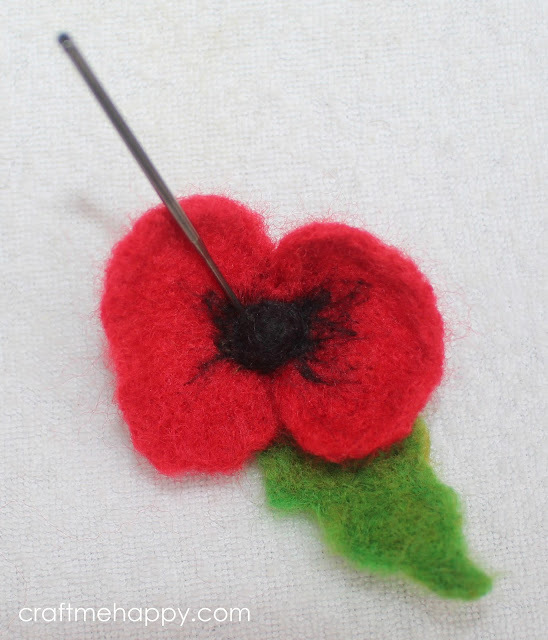 Again, here's the poppy after the second addition of black fibres to the poppy centre. 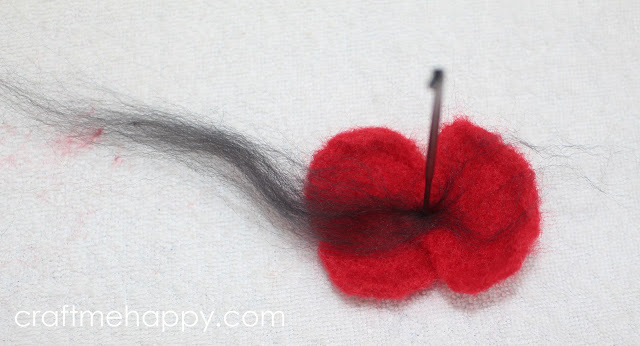 I wanted my poppy centre to be more of a dome shape and I wanted a bit more black shading on the petals, so I added a couple more wisps of black fibre in the same way, focusing my needle around the centre to shape it into a circle. To give my flower more shape and life, I pricked the petals repeatedly from the back into the black centre. To make the leaf, I took a section of green wool and, beginning at the base, I pricked it repeatedly until it formed a dense, narrow point. 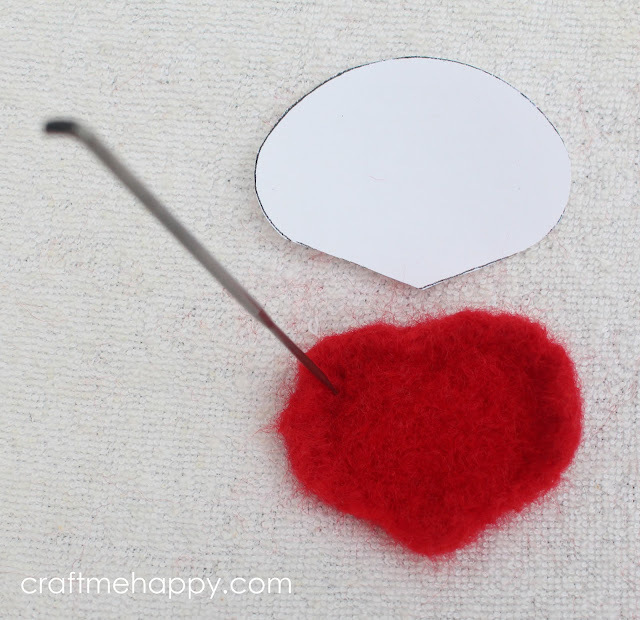 I then needled the rest, flipping it and stabbing it in the same way as the flower until I got a basic leaf shape. I then repeatedly poked into the side of the leaf to shape the undulated outline. 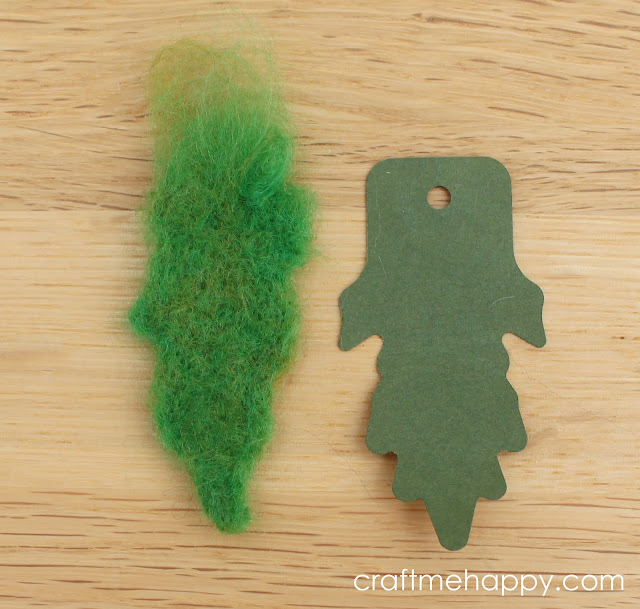 I left the top of the leaf loose and fluffy, so that I could attach it to the back of the petal. Here's the leaf and flower from the back. 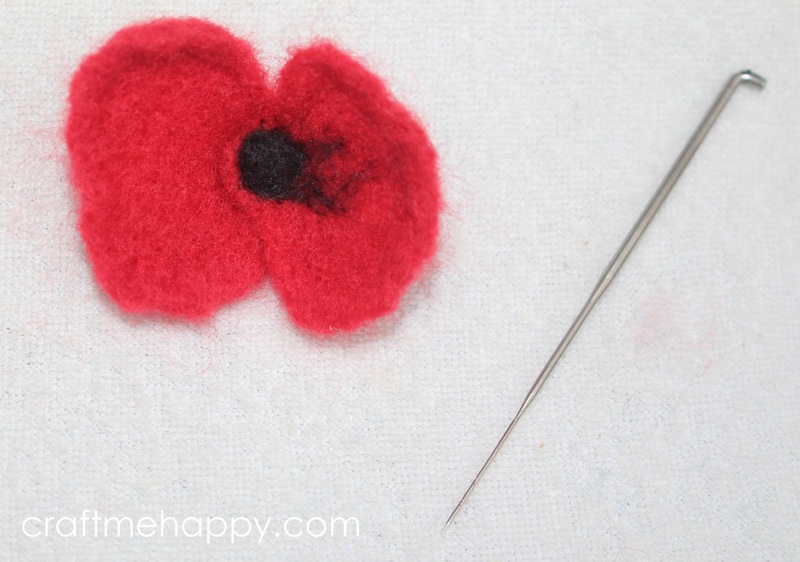 All of the loose fibres were repeatedly stabbed into the flower middle, both to finish off the leaf and to attach it securely to the back of the poppy. In attaching the leaf to the back, some green fibres were pushed to the front, so to finish it off, I added a little more black to the centre and worked the needle diagonally into the middle, to shape and curl the petals a little more. 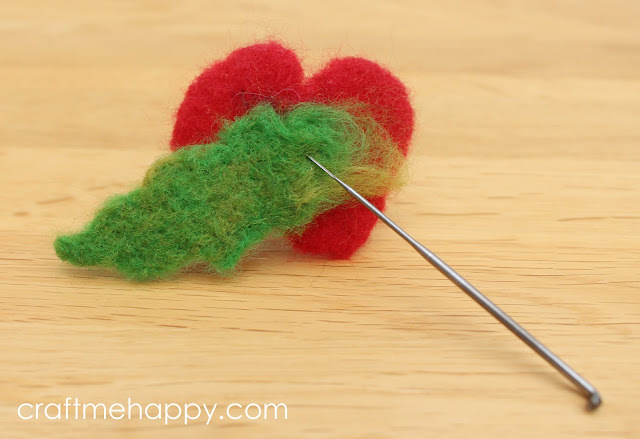 Needle felting is a very forgiving craft and you really can keep on prodding and poking it, adding more wool as needed, or pricking it more to shape or shrink it further. 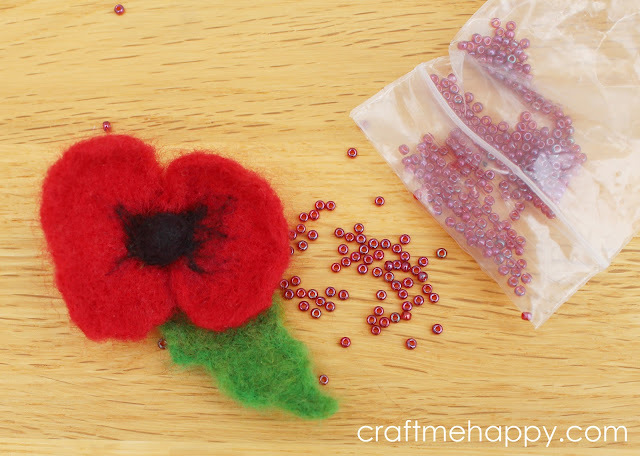 I decided to give my poppy more of a handmade look by adding some tiny transparent red burgundy beads around the centre. Finally, I stitched a little safety pin to the back using the same thread that I had used for the beads. 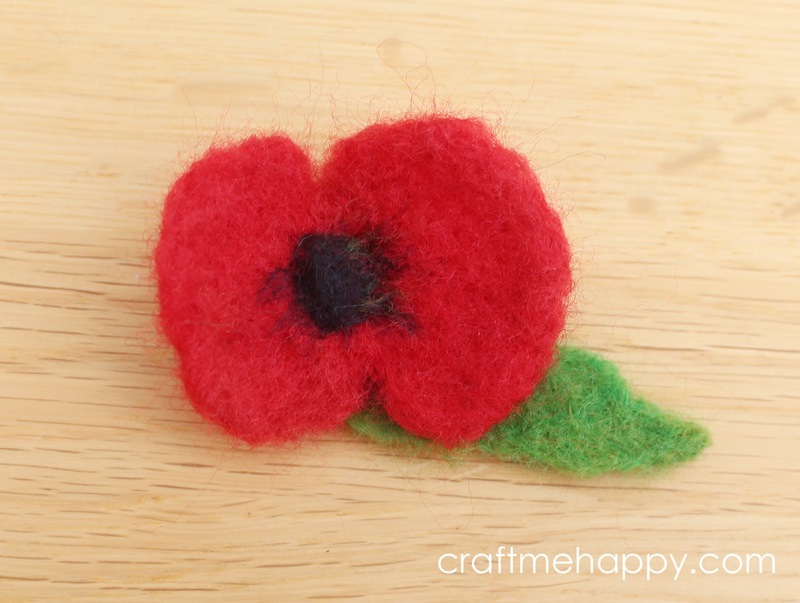 I love my daughter's little Remembrance Day poppy. 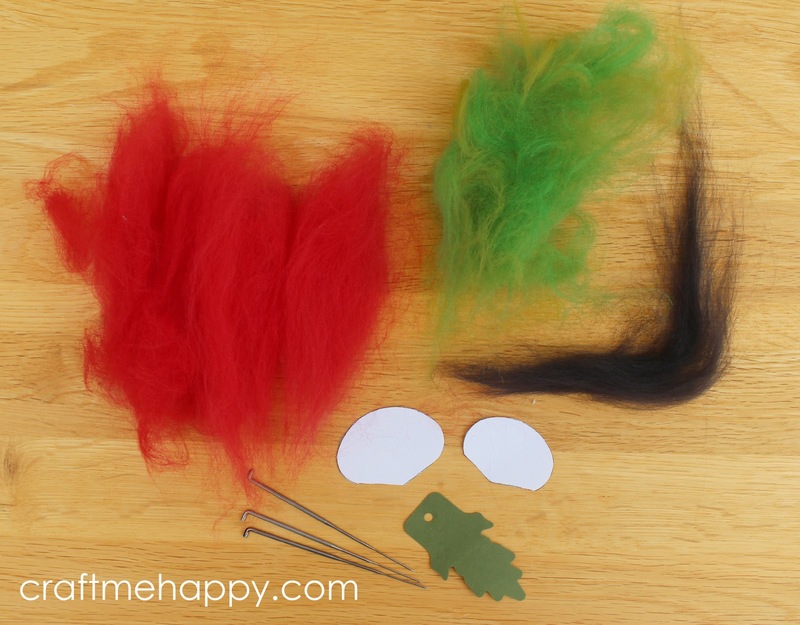 It is simple, but eye-catching and two weeks later, it's still not fallen off! 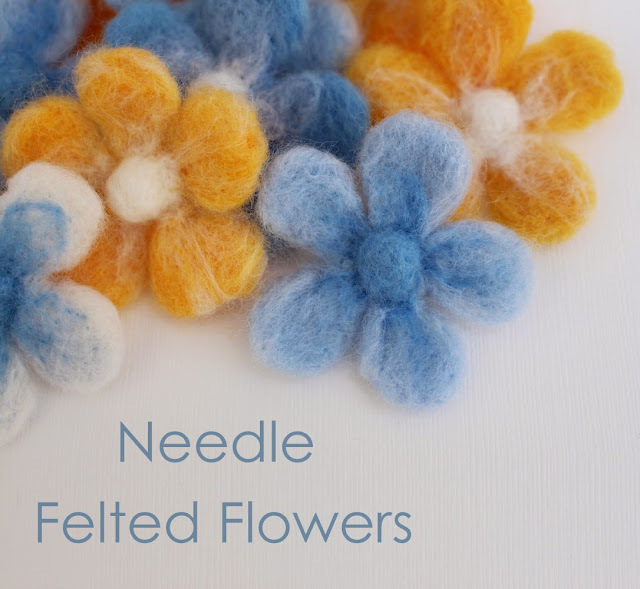 If you have enjoyed this post, but you're not quite ready to try shaping your own petals, you might want to look at my very popular post on easy needle felted flowers.